Host Jovelyn Richards opens the hour with Executive Director Lori Sokol of Women's eNews, Covering Women Issues/Changing Women's Lives. Based on an article written by Sokol suggesting that white women take a knee in response to the Supreme Court hearing caused many women of color to suggest: Once again white women are attempting a take over from black peoples' protest. Alex, Jalena, and Reaa of Breaktide Productions. 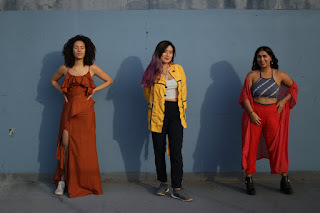 The second half of the how: Film makers Reaa Puri and Alex Bledsoe talk with Jovelyn Richards on ways in which their production team creates art to inspire women to heal from a intersectional, interconnected modality. Reaa and Alex along with Jalena Keane-Lee founded Breaktide Productions. Breaktide Productions is based in the Bay Area, owned and operated by Women of Color.